Over the course of a typical project, our architects spend time getting to know hospital staff and familiarizing themselves with the character of the local community. Rarely, however, does geography align such that we have the opportunity to seek medical services at our own completed facilities. 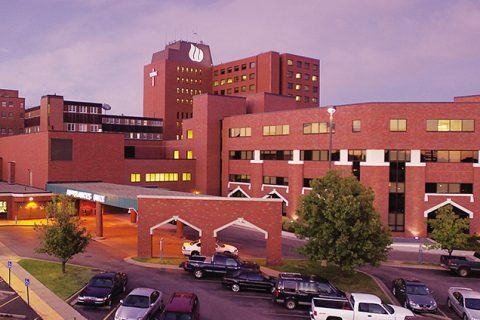 Throughout our extensive work at Wichita’s Wesley Medical Center, HFG Architecture has taken pride in the knowledge that our Wichita staff will directly benefit from the improvements made to this hospital system. Whether seeking emergency services or preparing for the birth of a child, our team members are now poised to experience firsthand the benefits of design decisions made during their work. Health Facilities Group has served Wesley Medical Center on numerous projects. Wesley is a major provider of primary care throughout Kansas, treating more than 24,000 patients annually and delivering more than 6,000 babies each year. HFG’s team has planned and designed significant improvements to several parts of the medical center, including remodels of the emergency departments at the main and west campuses; a Birthcare Center remodel and addition; and planning studies for multiple departments. In the phased ER remodel, Phase 1 consisted of moving the main waiting area while Phase 2 added 900 SF of new construction to the existing main waiting room. Phase 2 moved Triage so that it could hold two more beds and also expanded the sub-acute treatment room from three beds to seven and doubled the size of the Medication Room. The phased ER remodel included a total of 11,326 SF.